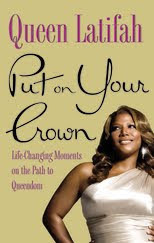 Modeled after Maria Shriver's Just Who Will You Be, Queen Latifah's goal with Put On Your Crown is to help young women build a strong sense of self-esteem. A US Dept. of Justice survey found that females ages 16-24 are more vulnerable to partner violence than any other group, almost triple the national average. Cases like Chris Brown's assault on pop star Rihanna showed an ugly side of adolescent life. However, Queen Latifah has always been a shining example of a woman happy with herself and unwilling to compromise to fit into the "hollywood ideal" of what a confident beautiful woman should look like. This book starts off as a self help book with Queen Latifah (whose real name is Dana) giving advice and trying to inspire young girls. Then, it transitions into more of a biography. I loved reading about Queen Latifah's life. I have always had a huge amount of respect for her. She has overcome a lot of odds to become famous as a large Black Woman. Yet, she is still loud, confident and beautiful. In this book she went into a lot of details about hardships she has had in her life such as going broke (this was after she was famous!) and the death of her Brother. The death of her brother hit me particularly hard. I also lost my older Step Brother in a motorcycle accident. It was even in the same month. This book is not all about hardships though, Dana also talks about her triumphs. She talks about climbing a mountain, becoming famous and even losing weight and exercising. She also talks about her family. Her Mother is a teacher who instilled a lot of strong values in her and gave her confidence. She has a best friend and partner who has been with her since high school, and a Father who goes on tour with her. She also says that all of her true friends are "normal people" that she has grown to trust through the years. She doesn't surround her self with people that will make her more famous or boost her career, she surrounds herself with the real people that she loves and cares about. After reading this book, I have even more respect for Queen Latifah. Whether or not you like her, I recommend reading this book. If you don't like her now, you will by the time you are done with this book. I personally love Queen Latifah! Giveaway ends 6/09/10 at 9pm EST. Giveaway is for US residents only. No P.O. Boxes. Winner will be chosen randomly. Winner will be contacted via e-mail and then will have 48 hours to respond before a new winner will be chosen.